Note: Since writing this article, I have received a lot of great feedback and additional tips. 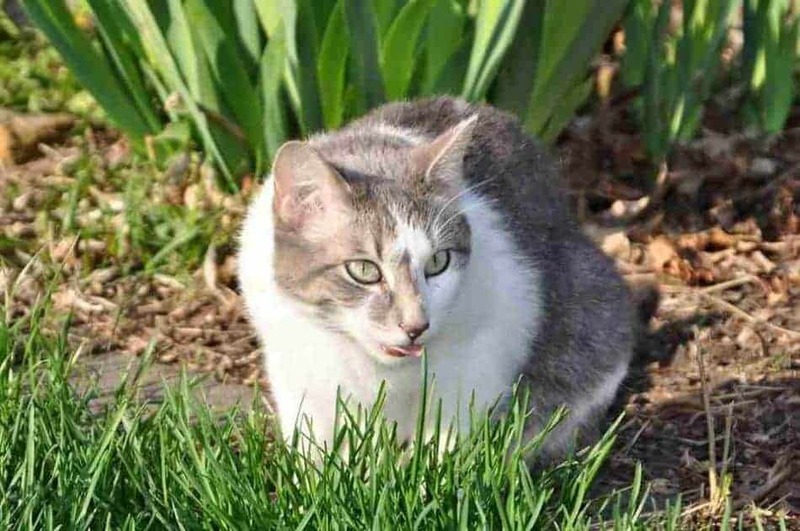 I recently added several updates to the bottom of the post that covers some additional questions and tips that I have received from readers. Be sure to read to the bottom of the post to see if those answer your questions. If you have a suggestion that could help others, be sure to add a comment! I find Skype to be one of the most useful tools out there when it comes to connecting with people around the globe. Whether it’s video chat with family or using it to instant message with my development team in India, it has become a staple tool for communicating. One limitation I have found, however, is that Skype doesn’t allow you to easily output, save, or print the communication stream. 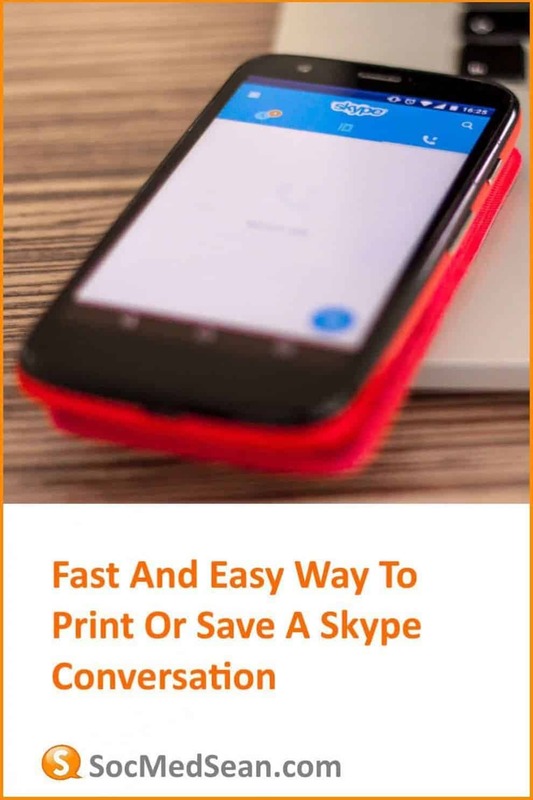 There are back-end ways that folks who are tech-trained can get to the saved conversations, but I thought I’d share a quick tip that anyone can use to save or print their Skype conversations. 1) When you Skype chat session is completed, right-click on any of the messages in the conversation and choose “Select All” from the dropdown menu. 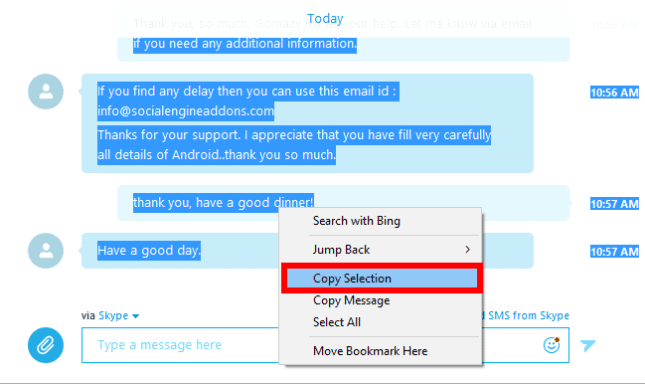 2) With all of the messages selected, right-click on any message and choose “Copy Selection” from the dropdown menu. 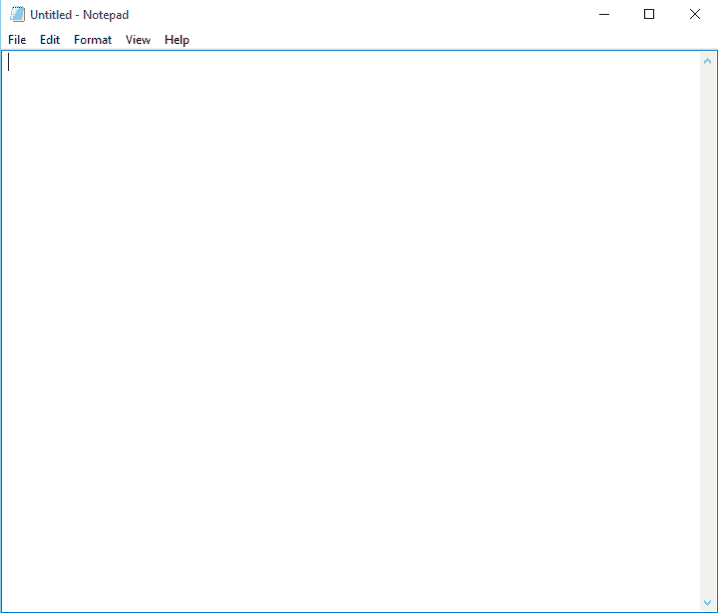 3) Next, open Notepad or Microsoft Word and create a new document. 4) In the empty document, right-click anywhere and choose “Paste” from the dropdown menu. 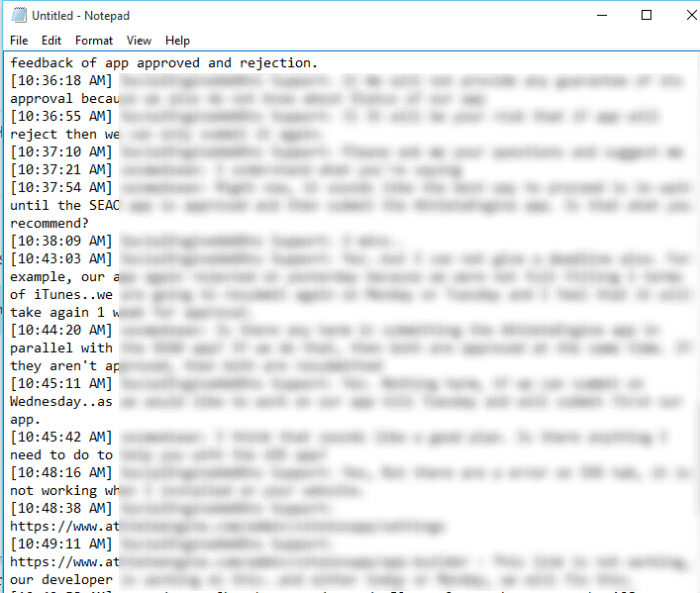 The contents of the entire conversation, including the sender name and the timestamp are added to your new document. 5) Choose File –> Print or File –> Save and you have the ability to print or save the entire conversation. NOTE: One reader made a comment that you can also use Microsoft Word as the destination for pasting the Skype conversation, which is absolutely accurate. You can paste your Skype conversation into any text-based reader. If you want to email it to yourself to be able to save and refer back to later, just paste it into an Outloook email or a Gmail email. Really, anywhere you need to paste it that will accept text will suffice. I know it’s not the ideal way to be able to archive Skype conversations, but until Skype gives us the ability in their native app, it’s a solid workaround that works every time. Know of a better way? I’m always open to hearing new suggestions, so add it to the comments section. Update 1 – What If I Already Closed The Skype Conversation? So, I hunted down the way to print or save a Skype conversation even after the conversation had been closed. 1) Click on the Contacts tab in the Skype app. When you display the contact, Skype shows you the previous conversations. 2) Then just right click on the conversation and choose Select All. Like the tip above, it will highlight the entire conversation. 3) Right-click on the highlighted text (be sure you are on the text) and choose “Copy Selected”. 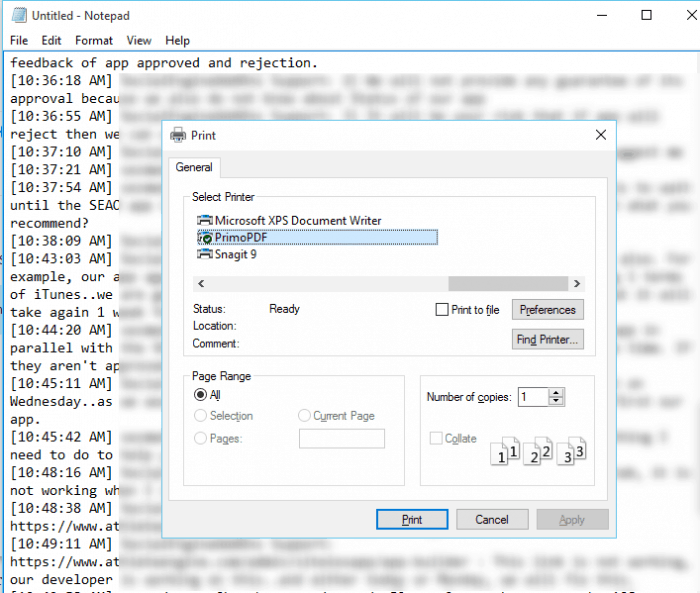 4) Follow the steps above to paste the text into Notepad, MS Word, or your email client if you want to email it to yourself. 5) From Notepad or Word, you can either print a physical copy or your can save it as a document for future reference. Update 2 – Can I Record The Skype Conversation Using A Screen Recorder? Hey Sean – What about just recording the conversation as it starts? Do you have a good recommendation for screen recording software that could record the online chat? Bonus if that same software could act as a call recorder for audio calls. That’s a great question, Mike…and one that I actually do have an answer for. And the best thing is it’s a tool that works great to record chats and call on both PC and Mac! Trim video clips after you record them. The nice thing about this is it allows you to trim a 30 minute video call down to 10-15 minutes by editing out all the non-relevant chatter. Toggle back and forth between your webcam and your computer screen while you are recording. This is especially nice because it allows you to switch to show who is talking. In addition to being able to do all that for video, Snagit is also an outstanding screen capture tool, one that anyone who needs to grab screen captures of charts and graphs from your computer screen needs. At ~$50 for the software, it’s been a great purchase for me and I keep on recommending it to others. If you can to give Snagit a try, they do offer a free trial. While it’s not completely free screen recording and editing software, at least you can test it first and see if the $50 is worth the investment. Hope that helps! If you know of a completely free tool to do screen recording let me know. Thanks to Dave C. for sharing another tip with me. Apparently, ECamm is another software tool that was designed specifically to record Skype video calls. They have a pretty good video on their site detailing how it works and it looks pretty nice. Unfortunately, I’m PC-based, so I can’t test it out. I’d love to hear whether others have had good experiences using ECamm on their Mac for recording Skype conversations. Leave a comment if you have some experience with the software. Thanks to comments from DizzyNC and Midsummer100 below, they alerted me to some changes to the Skype interface. It looks like Microsoft has removed the “Select All” option from the dropdown menu and replaced it with “Select Messages”. The new Skype dropdown menu removed “Select All” and replaced it with “Select Messages”. 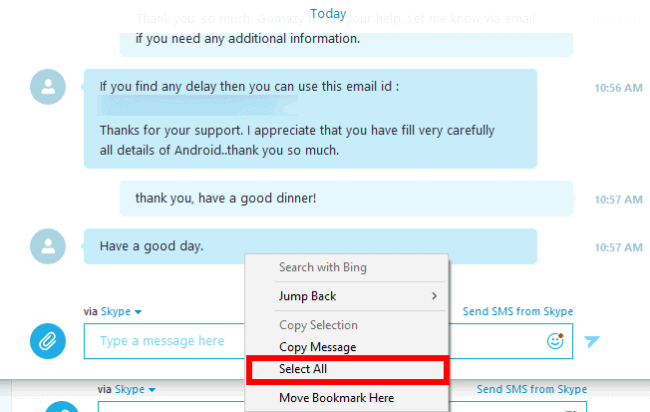 Once you click “Select Messages”, the Skype interface changes by adding circles to the right of each message. You can click each circle like a checkbox to indicate that you want to select the message. 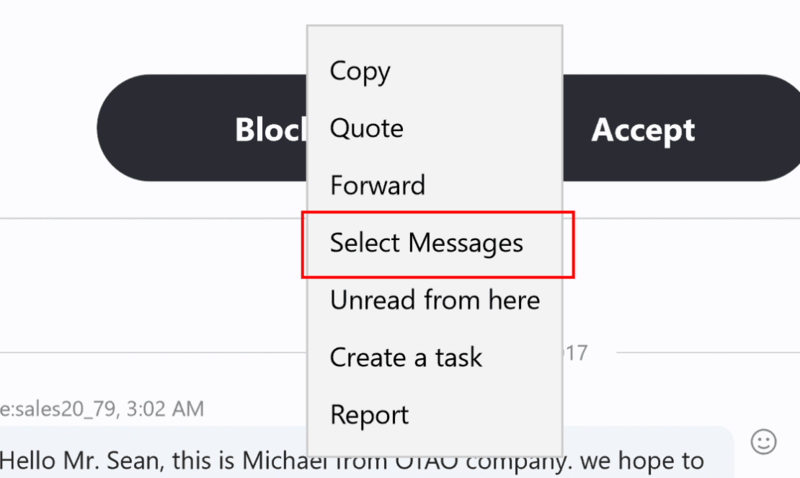 Once you have the messages selected that you want to save, click the “Copy” button at the bottom of the messages and all of the checked messages will be added to the clipboard. From there, you can paste the contents into a text document, MS Word document, or email and save them for posterity. The nice thing about this change is you no longer have to save every message in the conversation. You can pick and choose the ones that you want to archive. The downside is you have to go through and click each and ever message that you want to save. Want to save the entire conversation? You have to click every single message. Blech! One interesting note is you can now forward chunks of a conversation to another Skype user by selecting certain messages and then clicking the “Forward” button. Might be useful if you want to share some pertinent information with another user who wasn’t part of the original conversation. Thanks, again, for the comments and help! It keeps the post fresh and ensures that readers are getting the best information. This has been the universal Windows procedure for such a task… until now. The Skype v8.42 developers and programmers have utterly broken this protocol and come up with a really lousy, non-intuitive, incomprehensible user interface to boot. They individually and collectively deserve to be castrated (males), forcibly deflowered (females) and then taken out and shot! How did the Microsoft product managers allow this to happen??? It’s utter stupidity like this that might yet turn me into an Apple person. P.S. Your article and information provided were poorly written, lacked the necessary detail, didn’t work, and was totally useless. I hear you on the issue, Joe. It’s irritating that MS keeps changing the ability to save and print a Skype conversation. In 8.4.2, however, update #4 works. I just tried it. Maybe you were to angry to get that far, but you can select the conversations that you want to print and then copy or forward them. Still testing Miranda NG as a replacement for Skype. (It does use the Skype protocol, after you download the program, click on Skype protocol on the main page on the website and it will take you to the Wiki page which lets you download the Skype DLLs which you need to add to the program folders) Miranda is highly customizable and I’ve been able to change text size and colors, including a full selection of all system fonts! So this is really an excellent solution for anybody who can’t stand the look of the new Skype with its hard to read font and a whole lot of 3 size choices! It also can log chats to disk and as I mentioned you can copy the chats directly to Word with full color and formatting or to other programs. What a great find! Microsoft has essentially destroyed Skype. Years ago we debated in our Economics class if there was an opposite to “technological progress”. Microsoft proves there is. Our whole office used to revolve around Skype. Now I’m the only user in the office and that makes it pretty useless. Are they intentionally destroying Skype in order to move users to other platforms or is it just the typical arrogant incompetence? I might have a solution for now! I just tested Miranda NG, which is a light universal IM client which is able to communicate with the Skype network. It provides a log which is easy to copy and paste into any application with timestamps up to the second. I only started to test it and will see how it goes. But did you notice that in the latest version 8.37.0.98, and even in the web preview version, when you try to copy the text and paste it, it just pastes everything as a bunch of text with no line breaks, and some missing spaces too! Without somehow reformatting it and adding line breaks and spaces, it’s hard to read. It’s like MS went out of their way to make it hard to just copy a log for some reason! MS wants to be the only one who has a copy of it. Pretty bizarre. I’m sure it’s possible to write a plugin for the web version that would log the chats into a file, but of course you need to be a programmer… Maybe someone will do it. Yeah, I don’t have the “Select All” option either. It seems MS removed that option it later versions. Has someone found a way around this? If you right click on a Skype conversation, you should see “Select Messages” rather than “Select All”. Once you click that, you can choose the messages you want to select by clicking the little circle to the right of each messages and then choose copy. Once you have copied them to the clipboard, you can paste them into an email, MS Word, or any text editor tha t you choose. Thanks for letting me know about the change, I will update the post. It looks like Microsoft made some updates. In the new version of Skype, when you right-click, you should see “Select Messages” rather than “Select All”. Once you click that, circles appear to the right of each message. You can then choose the messages you want to select by clicking the little circle to the right of each messages and then choose copy at the bottom of messages. Once you have copied them to the clipboard, you can paste them into an email, MS Word, or any text editor tha t you choose. I tried this, (Sean’s reply to Midsommer), I could select messages as described, circles were ticked, messages were selected, and when I pressed ‘copy’ at the bottom of the page it said ‘copied to clipboard’. However, when I tried pasting into a document, (I’m using Libra Open Office, which worked on the previous version of pasting skype chat.) literally only the name of the contact and time of the chat was pasted. None of the selected messages would appear. Any other insights anyone? Thanks for the article. At least got this far. This was helpful. Thanks a lot. It would have been even better if the chat was saved in Skype format as it gets saved in text format only. But anyway its better than losing chat history. Thanks again. I agree that text isn’t necessarily the best format, since you lose any images and/or icons. But at least it saves the text and makes it searchable for future reference. You can also paste it into Word.